Jakarta (VNA) – The Secretariat of the Association of Southeast Asian Nations (ASEAN) hosted a ceremony at its headquarters in Jakarta, Indonesia, on August 11 to celebrate the bloc’s 50th founding anniversary (August 8). The event was attended by Indonesian President Joko Widodo, ASEAN Secretary-General Le Luong Minh and Deputy Secretaries-General, the foreign ministers of Indonesia and Malaysia, along with a number of officials from ASEAN member states, and representatives of international and non-governmental organisations and ASEAN’s partner countries. 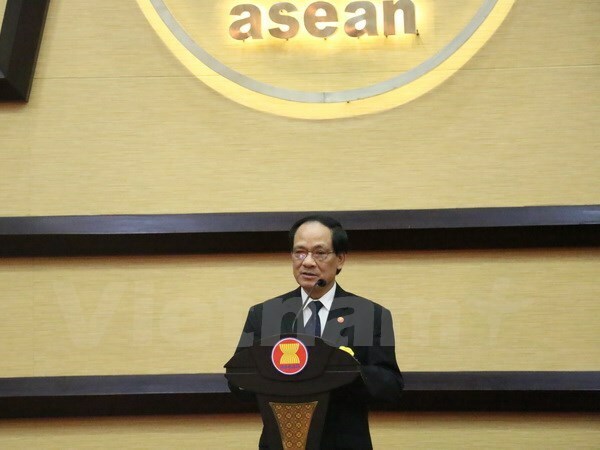 Addressing the ceremony, Secretary-General Minh said ASEAN has been strongly developing over the past five decades and becoming an important region, contributing greatly to peace, security and prosperity in Southeast Asia and the world. The association has made considerable progress to become one of the successful and effective regional organisations in terms of regional peace and security, economic integration, and institutional building, he noted. However, the Secretary-General stressed that there remain a number of challenges facing ASEAN nowadays, adding that the association needs to continue supporting its member nations, partners, dialogue partners and other relevant parties. The group also needs to maintain solidarity to deal with complicated circumstances arising during the process of regional and global development, including the spread of extremism and terrorism, protectionism, proliferation of nuclear weapons, and tensions of maritime disputes. In his speech, Indonesian President Joko Widodo urged ASEAN members to connect together more closely to improve the capacity of responding to challenges amid weak growth of the global economy. While conflicts have occurred in many places around the world, ASEAN has still managed Southeast Asia as a stable region, he said, adding that its member countries must resolve issues through dialogues and negotiations. The President also expressed his belief that ASEAN, with 50 years of development, will truly bring benefits to people in Southeast Asia.